The old charming fishing village is located along the salt-water lagoon - ETANG DE THAU - with lots of flamingos and egrets. 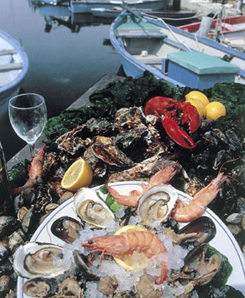 The people here make their living from the oyster and mussel business and the matching white wine PICPOUL de PINET. The world famous aperitif wine NOILLY PRAT comes from MARSEILLAN. Next to the port this well-known producer stores his wines in hundreds of oak-barrels under the sun. This old village with its picturesque old town and narrow streets is surrounded by vineyards and about 3 miles from the Mediterranean Sea. 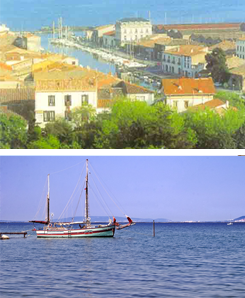 There, from the holiday village MARSEILLAN-PLAGE spans a long, ample fine white sand beach up 3 miles to CAP d`AGDE and 6 miles to SETE. 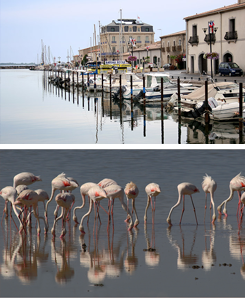 The touristic village of MARSEILLAN-PLAGE (the beach) itself is situated along the coastal stripe between SETE and AGDE. The community was found as a pure holiday location allowing no traffic through. Most of the visitors are families with children. The endless fine white sands show clear water and gentle sloping beaches just perfect for children. The village offers all shopping facilities. You will also find a post office, bank, laundry, pharmacy, doctors and of course many restaurants. In July and August the daily market will provide you with all the local products from fruits and vegetables to fresh fish. Should you be looking for entertainment your children will love the go-cart circuit and during the busy season the Luna Park in the evening.